Walking East from Spitalfields down the Mile End Rd, I arrived at the gateway surmounted by two stone eagles, and reached through the iron gate to pull on a tenuous bell cord, before casting my eyes up at Malplaquet House. 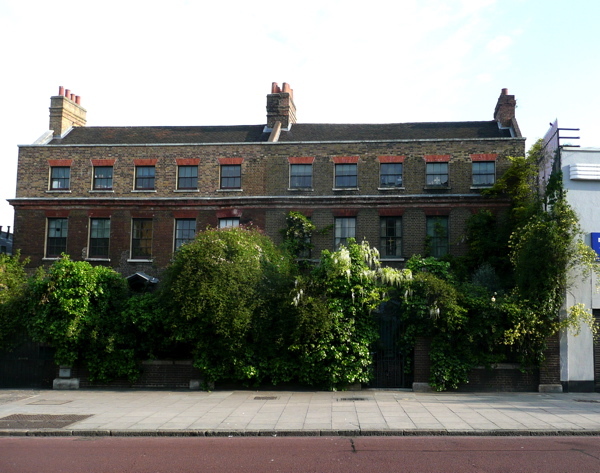 Hovering nervously on the dusty pavement with the traffic roaring around my ears, I looked through the railings into the overgrown garden and beyond to the dark windows enclosing the secrets of this majestic four storey mansion (completed in 1742 by Thomas Andrews). Here I recognised a moment of anticipation comparable to that experienced by Pip, standing at the gate of Satis House before being admitted to meet Miss Havisham. Let me admit, for years I have paused to peek through the railings, but I never had the courage to ring the bell at Malplaquet House before. Ushered through the gate, up the garden path and through the door, I was not disappointed to enter the hallway that I had dreamed of, discovering it thickly lined with stags’ heads, reliefs, and antiquarian fragments, including a cast of the hieroglyphic inscription from between the front paws of the sphinx. Here my bright-eyed host, Tim Knox, director of Sir John Soane’s Museum, introduced me to landscape gardener Todd Longstaffe-Gowan with whom he restored the house. 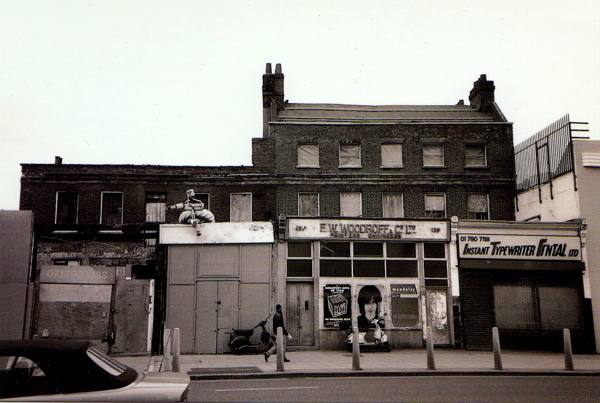 In 1998, when they bought Malplaquet House from the Spitalfields Trust, the edifice had not been inhabited in over a century, and there were two shops,“F.W. Woodruff & Co Ltd, Printers Engineers” and “Instant Typewriter Repairs,” extending through the current front garden to the street. Yet this pair of single-minded fellows recklessly embraced the opportunity of living in a building site for the next five years, repairing the ancient fabric, removing modern accretions and tactfully reinstating missing elements – all for the sake of bringing one of London’s long forgotten mansions back. Today their interventions are barely apparent, and when Tim led me into his Regency dining room, as created in the seventeen nineties by the brewer Henry Charrington and painted an appetising arsenic green, I found it difficult to believe this had once been a typewriter repair shop. 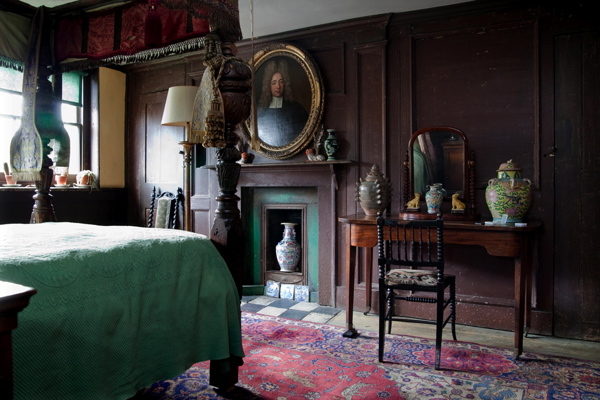 Everywhere, original paintwork and worn surfaces have been preserved, idiosyncratic details and textures which record the passage of people through the house and ensure the soul of the place lingers on. The sum total of the restoration is that every space feels natural, as you walk from one room to another, each has its own identity and proportion, as if it always was like this. 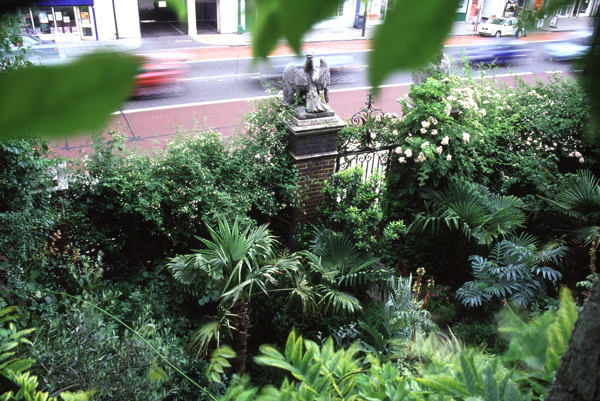 By December 1999, the shops had been almost entirely removed leaving just the facades standing on the street, concealing the garden which had already been planted and the front wall of the house which was repaired, with windows and front door in place. Then, on Christmas Eve an exceptionally powerful wind blew down the Mile End Rd, and Tim woke in the night to an almighty “bang”, only to discover that in a transformation worthy of pantomime, some passing yuletide spirit had thrown the shopfronts down into the street to reveal Malplaquet House restored. 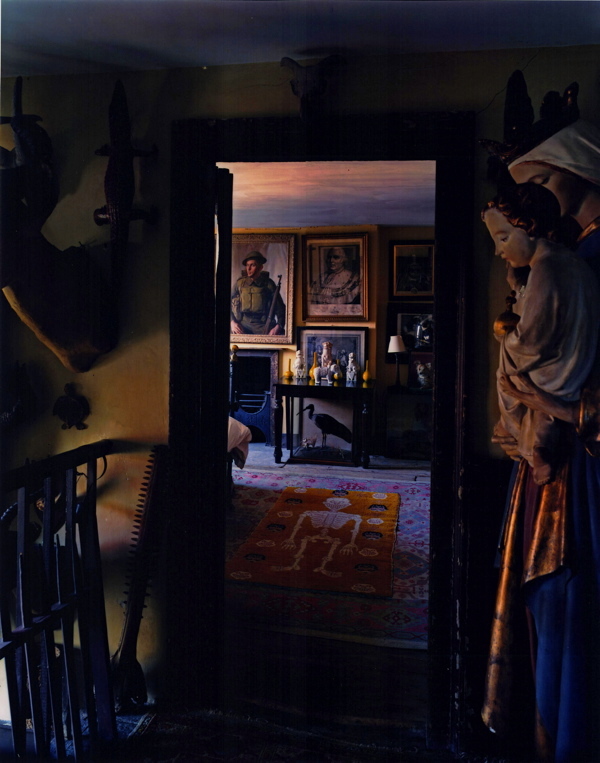 It was a suitably dramatic coup, because today the house more than lives up to its spectacular debut – it is some kind of masterpiece. 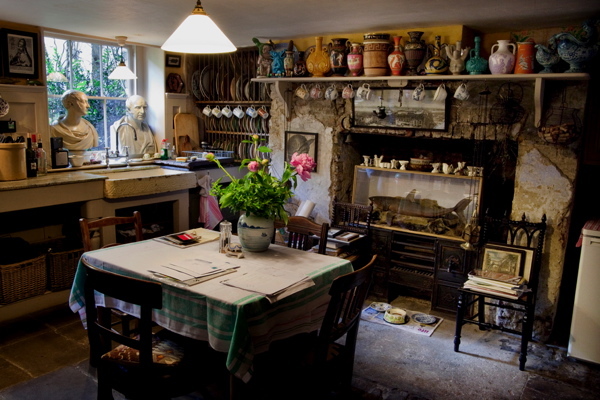 I hope Tim will forgive me if I confess that while he outlined the engaging history of the house with professional eloquence – as we sipped tea in the first floor drawing-room – my eyes wandered to the mountain goat under the table eyeing me suspiciously. 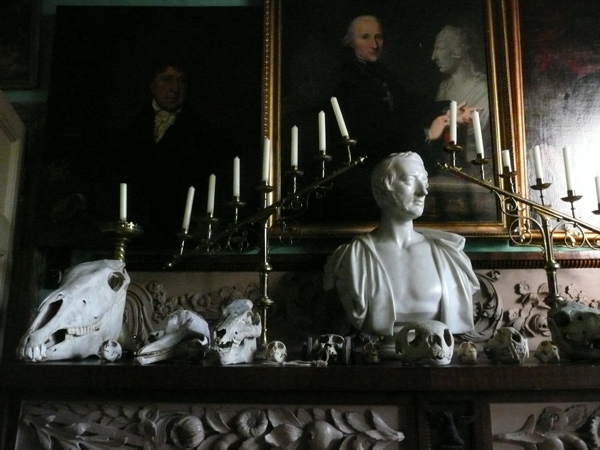 Similarly, in the drawing-room, my attention strayed from the finer points of the architectural detail towards the ostrich skeleton in the corner. As even a cursory glance at the photos will reveal, Tim & Todd are ferocious collectors, a compulsion that can be traced back to childhoods spent in Fiji and the West Indies. 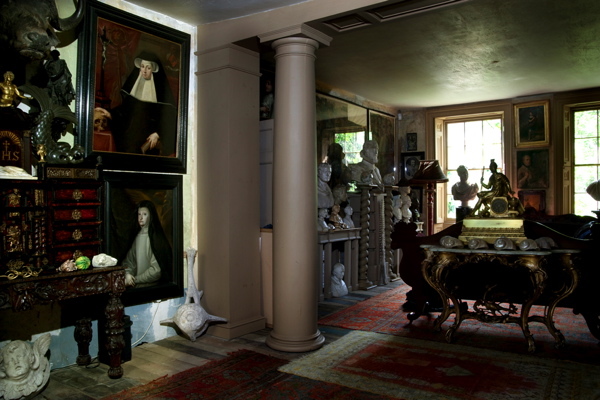 They have delighted in the opportunities Malplaquet House provides to display and expand their vast collection of ethnographic, historical, architectural and religious artefacts, natural history specimens and old master paintings. Consequently, as Tim kindly led me from one room to another, up and down stairs, through closets, opening cupboards in passing, directing my gaze this way and that, while continuously explaining the renovation, pointing out the features and giving historical context, I could do little but nod and exclaim in superlatives that grew increasingly feeble in the face of the overwhelming phantasmagoric detail of the collection. 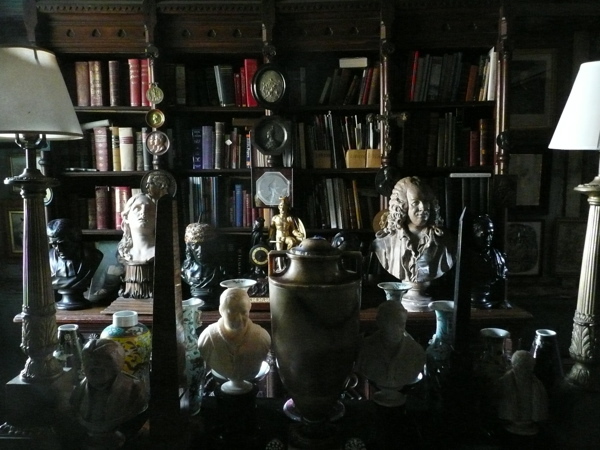 In fact, the collection has outgrown the house and the startling news I have to impart is that after twelve years, the owners now seek a larger home for their acquisitions, out of London. 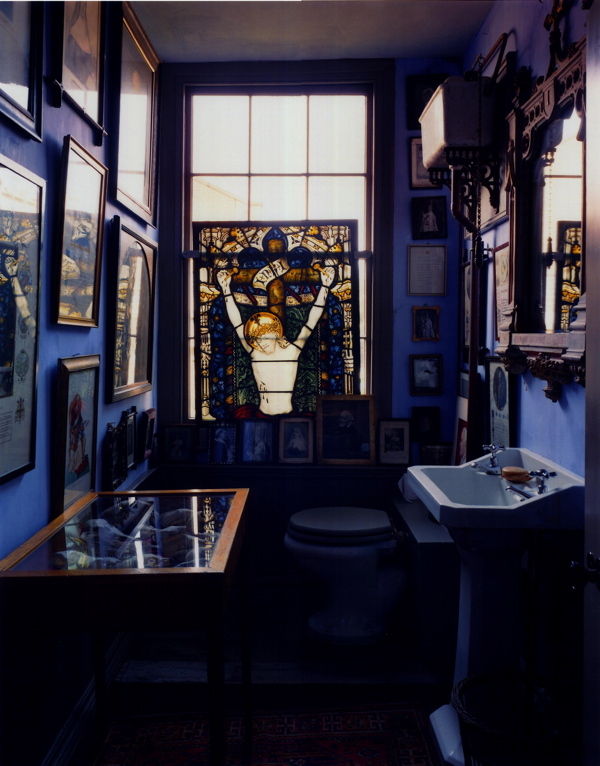 Gazing from an upper window and turning his back on the collection, Tim explained how fascinated he is by the everyday life of the Mile End Rd and the taxi office across the road that has remained open night and day since he first came to live here. Next, we walked into the walled yard at the rear, canopied by three-hundred-year-old tree ferns, and wondered at the echoing sound of a large community of sparrows that have made their home in this green oasis. It is a curious paradox of submitting to the spell of this remarkable house that the ordinary world becomes exotic by comparison. 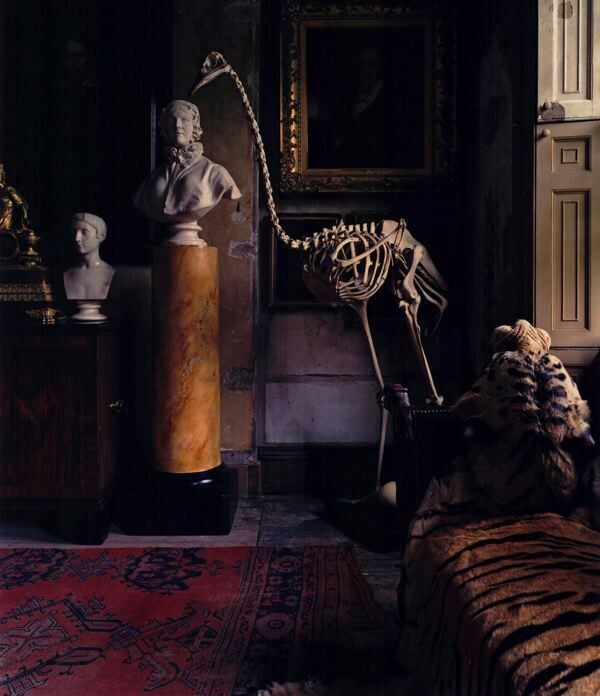 I have been in older houses and grander houses, but Malplaquet House has something beyond history and style, it has pervasive atmosphere. It has mystery. It has romance. You could get lost in there. When I came to leave, I shook hands with Tim and lingered, reluctant to move, because Malplaquet House held me spellbound. After my hour’s visit, I did not want to leave, so Tim walked with me through the garden into the street to say farewell, in a private rehearsal for his own departure from Malplaquet House one day. Beautiful. Tim always lived in amazing style. Even when he lived in 1 bed flat it looked majestic! When I first became aware of these houses in their renewed state some years ago I couldn’t place them in my visual memory of childhood. And I would have walked this way all the time going to what I thought was called ‘The Moony Sipal’ but was in fact the municipal baths (now the Globe Centre) on Mile End Road. It was only when someone showed me a picture of the shop fronts that I could work out what had been there before. I must say that just as I find Brick Lane being fashionable amusing the thought of properties for sale on the Mile End Road for over 2 million pounds is mind boggling. And I know it is the nature of inner London to have extreme poverty and wealth cheek by jowl but, with the general overcrowding in Tower Hamlets, to have such space – while no doubt the outcome of brave risk taking and much hard work – still worries me slightly. Dear Joan, You might be interested to know that when the Spitalfields Trust acquired Malplaquet House in 1998, the gardens were handed over to a housing association for the construction of sheltered housing. By this compromise, the demands of both historic preservation and social housing were satisfied. in this condition , in this area. thanks for letting us have a look. Absolutely amazing – to see abandoned homes become loved ones…thank you so much for letting us see this. My father was joint director of F W Woodroff printing engineers. I spent many days in my school holidays running around the upper floors and annoying my mum who worked in the office on the first floor. I must have walked past her a thousands of times and never realised such a gem existed in Stepney.